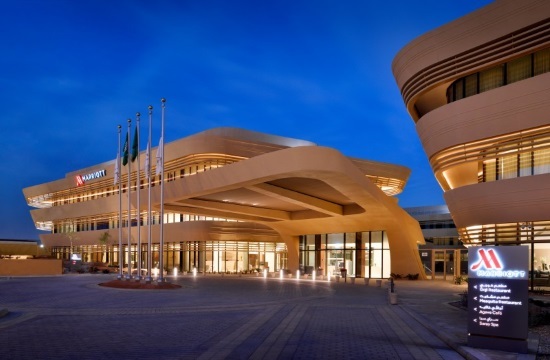 RIYADH, Kingdom of Saudi Arabia, March 28, 2019/ -- Marriott International (www.Marriott.com) and Dur Hospitality today announced the opening of Riyadh Marriott Hotel Diplomatic Quarter and Marriott Executive Apartments Riyadh, Diplomatic Quarter. The complex is strategically located in the heart of one of the most sought-after areas in the city with easy access to key embassies and major corporate headquarters, just a 30-minute drive from King Khalid International Airport. Riyadh Marriott Hotel Diplomatic Quarter houses three dining venues, Gojia Kitchen – a sophisticated all day dining destination, a la carte restaurant Mesquite and Agave Café located in the lobby. The hotel offers multiple recreational areas surrounded by lush greenery. An open-air swimming pool serves as an ideal spot to unwind after a long day. Other facilities include 24-hour Fitness Centres for both men and women and a sublime Saray Spa featuring a Turkish Hammam and female and male treatment rooms. To find out more about the hotel and Marriott Executive Apartments please visit: www.Marriott.Com/RUHDQ & www.Marriott.com/RUHED and stay connected on Facebook.